The flavor of this beef is absolutely incredible! It is cooked in the slow cooker to tender and juicy perfection and perfect topped with melty cheese! 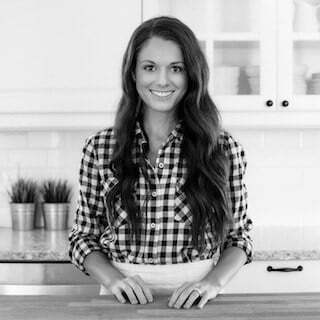 Hey heyyyyyyyy its Tiffany from Creme de la Crumb and I’ve got an awesome no-fuss dinner recipe for you today. Have I mentioned lately that I have a serious love affair with my slow cooker?? I do. It’s bad. I think my slow cooker gets a scrub down five times a week because I am ALWAYS using it. And by “it” I mean “them” because I have four. FOUR slow cookers?! Yes four. Because I am that obsessed. I told you it was bad! 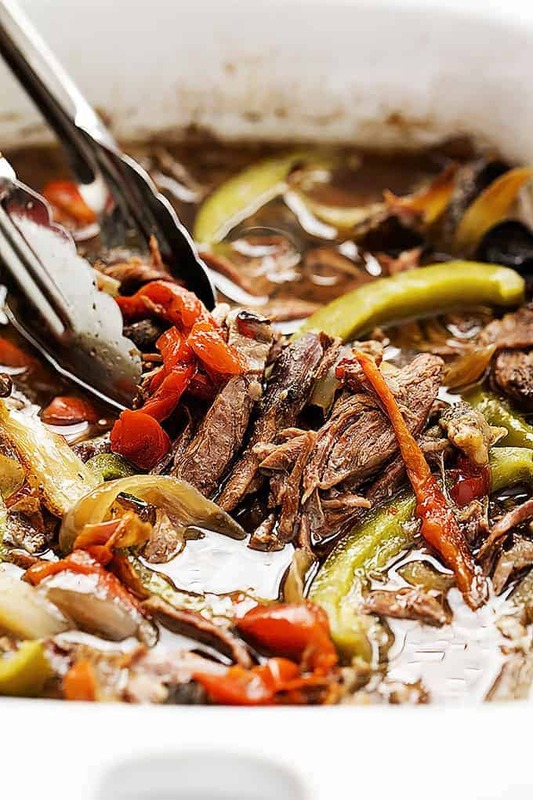 This recipe is just one of the many many reasons (no seriously, check out the plethora of reasons here) why I love slow cookers. Philly cheesesteak sandwiches are a favorite in my house and being the cook of the family, I really love this set it and forget it version. I like to take the extra five minutes to toast the hoagie rolls in the oven because really, I can spare five minutes when the recipe is this easy and it makes the whole sandwich ten times more amazing. And did I mention the flavor of this beef?? Incredible! So juicy and perfect when you pair it with that melty cheese. Make these pronto! You won’t regret it. Whisk together beef broth, salt, garlic powder, italian seasoning, salt, and pepper. 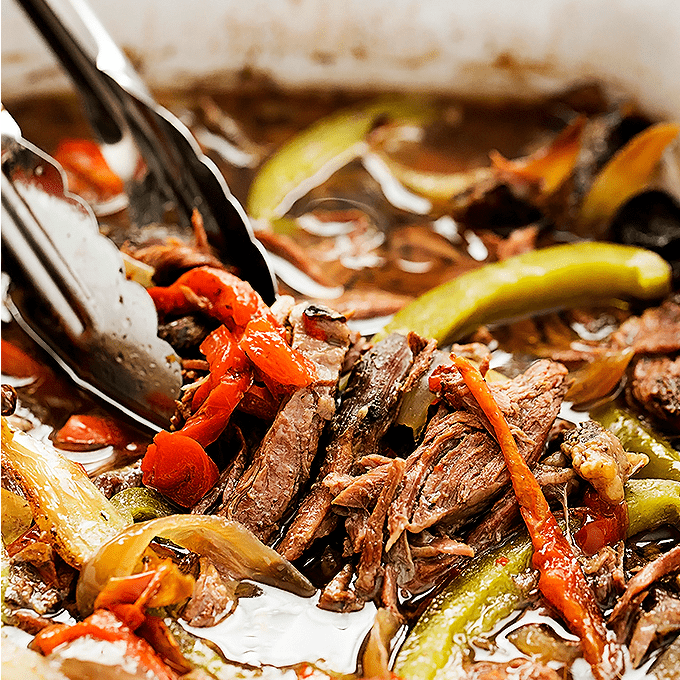 Add beef, onions, and peppers to slow cooker. Pour broth mixture over the top. Cover and cook on low for 6-8 hours. Preheat oven to 400 degrees. Line a baking sheet with foil. Open each hoagie roll and layer two slices of cheese in the middle. Place on baking sheet and bake for 5 minutes or so until cheese is melty. 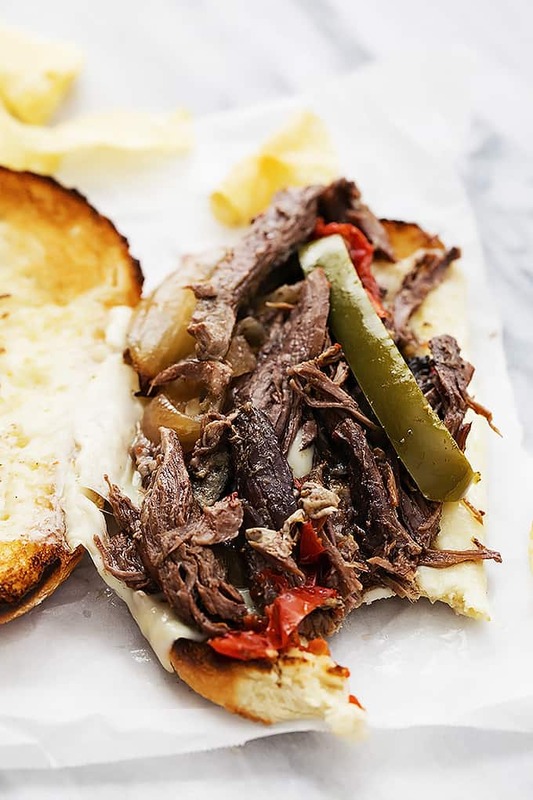 Use tongs to transfer meat and peppers to the middle of each hoagie roll (on top of cheese). Serve hot. No need to wait to try. You can always put it in a pan and cook it in the oven on low (325 for 4-5 hours). I do this some days when it’s cold just for a little extra heat in the house. I’ve also used the oven if I’m going to be out all day, set it at 300 and cooked for 6 hours. Another great recipe, thanks again, keep em coming ! Do you start with Frozen or thawed beef? Don’t you brown the beef? Cause the recipe looks like you add it uncooked. No, the slow cooker will cook your meat for you. You do not need to pre-cook the meat.